The Foreign Club, architect’s rendering by Frank Stevenson, 1928. Foreign Club casino, club and cafe, Tijuana. The Foreign Club (1917-1936), was Tijuana’s most popular casino and nightclub for many years until eclipsed by the grandeur of Agua Caliente. The compound was located on the corner of “Third and Main,” as American touristas referred to the streets back then [now, Tercera and Avenida Revolución], catty-corner from Mexicali Beer’s La Ballena bar and Alex and Paul’s Place/Original Caesar’s Place in the Hotel Comercial. In the early 1900s, progressives were shutting down gambling and aiming for the prohibition of liquor. California’s ‘Red Light Abatement Act of 1913’ pretty much shut down prostitution in San Diego’s Stingaree District. So three American investors, Marvin Allen, Frank Beyer and Carl Withington, formed their ABW Syndicate (Owl Cafe, Monte Carlo, Tivoli Bar, Foreign Club, Jockey Club) to fully take advantage of Baja California’s licensing of gambling casinos, cabarets, saloons and prostitution. Wirt G Bowman joined the group on Withington’s death, and later invested in building the Agua Caliente casino and resort. A silent partner who afforded them some protections was Colonel Aberlardo Rodriguez, former president of México and later governor of Sonora. After a fire, the resort was completely redesigned and rebuilt by San Diego architect Frank W Stevenson (Glen Abbey Memorial Park, Bush Egyptian Theatre, San Diego YMCA, Hotel Comercial in Tijuana, Colonial Hotel in La Jolla, etc). Rita Cansino cigarette card, 1935. 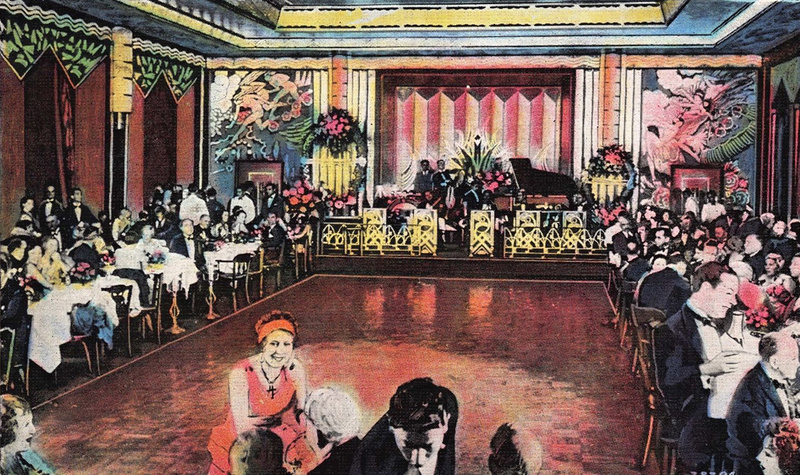 The Foreign Club Cafe de Luxe was the place to dine and dance after a heavy night of gambling — cards, roulette, slots. Full meals were $1 to $1.50. A la carte you could get filet mignon with mushroom sauce for one dollar. Caviar, seventy-five cents. Breakfast served all day – their rhum omelette was a pricey one dollar. As for native Mexican food, they offered homemade chicken tamales, stuffed peppers or turkey enchiladas, two for fifty cents. Local wines Blanco Brillante, Rioja Clarete, Rioja de Mesa Cenicero and Santo Tomas were one dollar a bottle. The Foreign Club catered exclusively to affluent Anglo-American customers who’d come down to ‘do Tijuana.’ Few Mexicanos were employed there, and blacks were not allowed admittance. Entertainment, of course, was provided — orchestras, floorshows and dancing. In 1932-33 the pre-eminent dancers to perform at The Foreign Club were Spaniard Eduardo Cansino and daughter Margarita. At the time Cansino, his Irish wife Volga and their children lived in Chula Vista, as many who work in Tijuana do to this day. Mexican President Cardenas’ ban on gambling effectively shut down entire resorts like the Foreign Club and Agua Caliente casinos. The Mexican government took possession, converting Agua Caliente into a girls’ school. The Foreign Club burned down in 1935. A more modern Foreign Club Hotel went up in its place later, and now TJ Pharmacy and other shops grace the corner. Foreign Club dancers Margarita and Eduardo Cansino. Above and below, menu from the Foreign Club, Tijuana, 1935. Posing at The Foreign Club gate, La Ballena bar in background. By 1950, the corner had dramatically changed. “ABW Syndicate” ‘Financier whose life along border became saga of West passes at Tucson,’ San Diego Union, 21 Apr 1949; and John Bowman, Don’t play on the trestle: A memoir, Xlibris Corporation, 2012. “the pre-eminent dancers” is from Barbara Leaming, If this was happiness: A biography of Rita Hayworth, New York, New York: Viking, 1989. Leaming’s bio portrays the teenage Rita as an emotionally-scarred child, prone to depression, due to the sexual abuse and violence of her father. “ban on gambling” is from contemporary reports in San Diego Union; San Diego Tribune; and Paul J Vanderwood, Satan’s playground: Mobsters and movie stars at America’s greatest gaming resort, Duke University Press, 2009.